29" x 56" historical map, 180 die-cut counters, 50-page rulebook (much of which is actually historical material), chapter divider, charts and play aids, 22 scenarios, 2 SASL missions, campaign game. As Dinah Washington sang, what a difference a day makes! 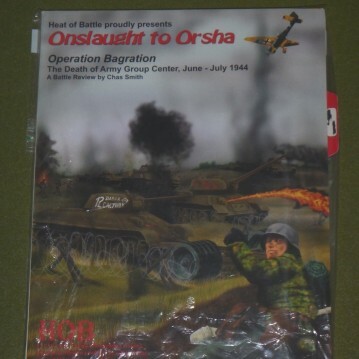 Onslaught to Orsha (OtO) was the first historical module released by HOB after Eddie Zeman left the company and designer Chas Smith and graphic artist Klaus Fischer joined. The difference between OtO and earlier HOB historical modules is like night and day in terms of production quality. OtO is not only the meatiest, most impressive, best bang-for-the-buck third party ASL module ever released, it is also quite impressive even compared to “official” ASL releases. Certainly it is HOB’s best and highest quality product to date (though even so, it suffers from the traditional HOB editing and proofreading problems, such as misspelling “onslaught” in the title of the game on the back of the packaging. 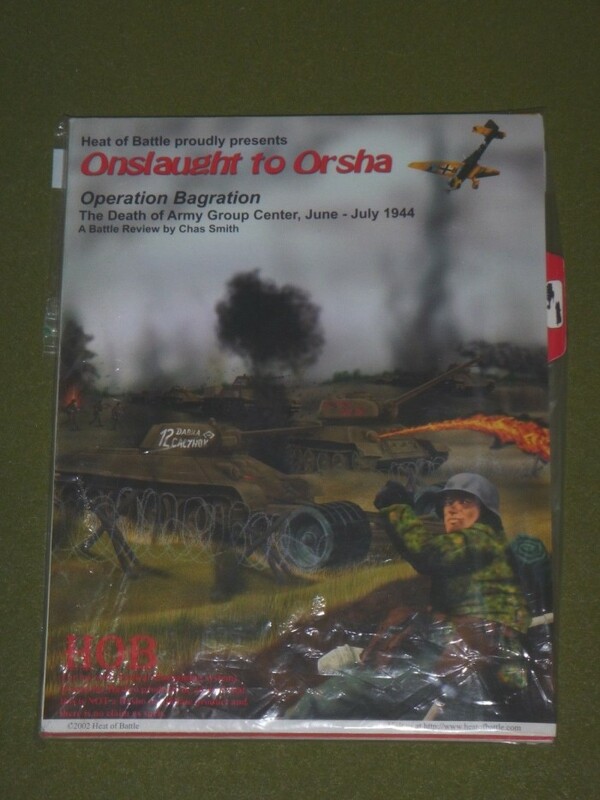 OtO (sometimes called the Operation Bagration/Onslaught to Orsha Battle Review) portrays actions connected to the battles along the Minsk-Moscow Highway in June 1944 during Operation Bagration, the destruction of Army Group Center and the death knell of the Third Reich. The centerpiece of OtO is the large rectangular historical map, the largest single map in any ASL module (it should have been split into two) and one of the largest ASL maps, period. It will take a long table to contain it. The OtO map depicts a battle-scarred Byelorussian landscape–flat and open, punctuated by occasional fields and orchards, and pockmarked with shellholes. A long rail line runs lengthwise through the middle. Graphically, the computer-generated map from Klaus Fischer and Sam Tyson looks quite different from previous HOB maps, which were hand-painted by Eddie Zeman, but not necessarily better than the Zeman maps. The open ground, which dominates the map, is a pale lime green, and the gully depictions leave something to be desired. Also, though it may seem to be quibbling, the grain hexes have graphics that run lengthwise, while the brush hexes have graphics that run widthwise, and the effect is somewhat odd. It would have been nicer if the brush terrain too had run lengthwise. However, it is still a decent map. 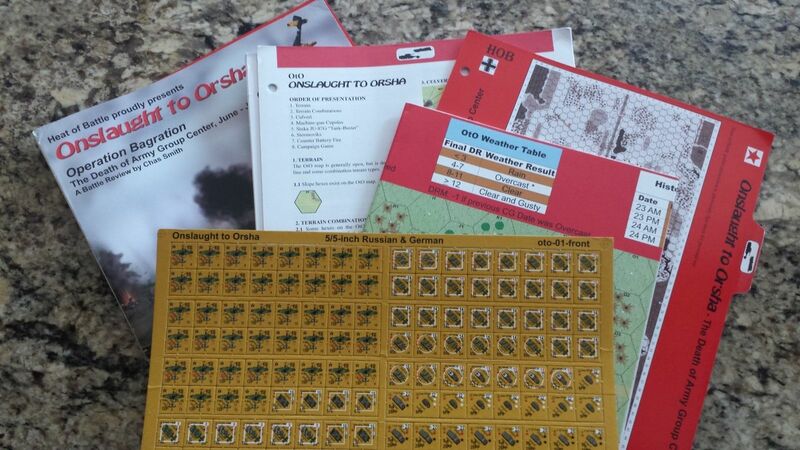 OtO includes an attractive, full-color rulebook (formatted and hole-punched just like an ASL rules chapter). It also includes a chapter divider (however, because the chapter divider includes an index tab, it is not strictly compatible with the 2nd edition ASLRB chapter dividers). 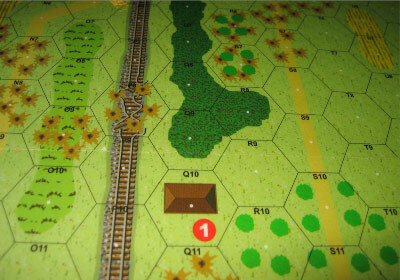 A variety of rules introduce players to the historical situation. New terrain is essentially limited to orchard-shellholes and grain-road hexes. More attention is spent on new hardware, including machine-gun cupolas, Stuka “tank busters” and Soviet Sturmoviks (to which more than 4 pages of rules are devoted), and counter-battery artillery modules. The latter represent artillery attacks designed to interfere with enemy OBA. Though these rules are not difficult, one wonders if perhaps offboard attacks against offboard artillery could simply have been abstracted out of the game entirely in some fashion. As is typical for HOB historical modules, full and instructive designer’s endnotes are included with the game that explain the historical rationale for certain design decisions. The rules also include Chapter H pages for the vehicle counters included in the module, which are mostly rare Soviet vehicles, including 4 varieties of flamethrowing tanks and 3 types of mine-rolling tanks, as well as counters for several Lend-Lease British and American vehicles. The counters themselves are extremely attractive, more so, in fact, than “official” counters because of their better use of color. Their only drawback is a too-dark HOB watermark (put there to make it obvious that HOB was not duplicating the “look and feel” of official counters). Had the watermark been fainter, the counters would have been wonderful. Even as is, they are striking, and illustrate how modern graphics can improve on the 1970s era counter graphics of ASL. Most of the rulebook deals with the included campaign game. 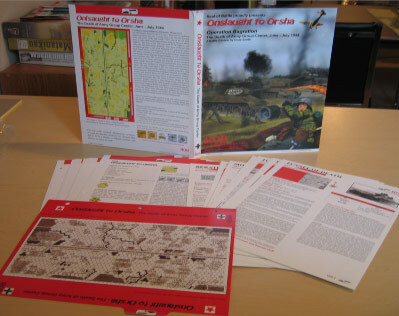 Unlike all previous HOB campaign games, which refer players to Kampfgruppe Peiper or Red Barricades for most of the campaign games rules, OtO actually includes complete campaign game rules (no more need to flip between two different rulebooks). Though short (only 4 campaign dates), the campaign game is quite massive in size (the Soviets, for example, may have 4 OBA modules occurring at once). The OtO rules also include a “map study,” which uses larger scale maps to place both the campaign itself and the various scenarios that appear in the module in historical context. It is well done. Also included are a few pages of historical commentary. The last ten pages of the rules are occupied by a lengthy regimental/division level order of battle for Operation Bagration. This order of battle takes up 20% of the entire rulebook, but has virtually no practical use for the module. Leaving it out would have kept the rulebook shorter and also cut back on the expense of the module (both to HOB and the consumer). It seems very much like an indulgence. 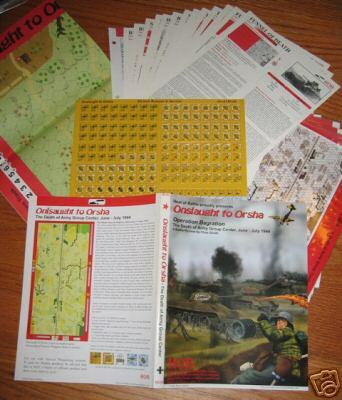 As if all the above weren’t enough value, OtO also includes two SASL missions, OTO-S1 (Breakthrough to Orsha) and OTO-S2 (The Crossroads), designed by Todd Hively and Daniel Zucker, respectively. The first mission actually uses the OtO historical map. The 22 included scenarios represent a mix of historical map (7) and geomorphic map (15) scenarios; some purchasers may be somewhat surprised to see that so few of the scenarios take place on the historical map. Confusingly, OtO uses two separate systems of scenario numbering. Geomorphic map scenarios are numbered OB1-OB15 (OB standing for Operation Bagration), while historical map scenarios are numbered OtO1-OtO7. One system would have been better. The scenarios themselves typically do not have extended special rules, but OBA and air support (sometimes both) are very common. Many of the scenarios use lots of fortifications (minefields, trenches, A-T ditches, pillboxes, wire) and represent assaults on fortified lines. Most of the OB scenarios are medium-sized, with some large scenarios thrown in. No small scenarios are included. The OtO scenarios, which use the historical map, are mostly large. The largest, OtO1 (Funnel of Death), features 41 Soviet squads, 13 MG and MTR crews, 4 FTs, 9 DCs, and 26 AFVs attacking 26 German squads, 10 MG crews, 8 guns, 11 AFVs, and fortifications including 7 pillboxes, 25 trenches, 6 foxholes, 16 wire counters, and a minefield. 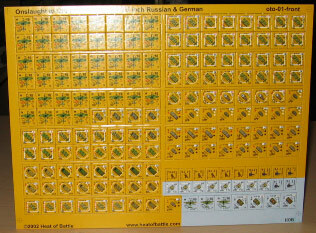 The Soviets get 4 artillery modules (70, 120, 150, and 200mm rocket); the Germans get 3 (100, 120, 150). Both sides also get air support. OtO’s scenarios have been fairly well-played since its release, especially considering their size and third party status; this is a reflection of the module’s popularity and quality. The majority of scenarios seem reasonably balanced, as does the campaign game. Though not flawless, Onslaught to Orsha is one of the more impressive ASL related products to date from any manufacturer. It is loaded with features and everything, from the physical presentation to the quality of the components to the scenarios themselves, is of high quality. OtO was so impressive that it helped give HOB an enormous reservoir of good will on the part of the ASL audience. It has certainly been Heat of Battle’s shining moment so far.